Mr. Vishwadeep Khatri, CEO, Benchmark Six Sigma visited SIMSREE on 27th December, 2013 as a part of SIMCON’s initiative to spread awareness among the batch regarding the relevance of ‘Six Sigma Practices (6ϭ)’ in today’s business world. Mr. Khatri is one of the most renowned trainers of six sigma worldwide, having over 15 years of experience in business process improvements related to service as well as manufacturing industries. He has worked as a trainer, consultant and an auditor. Apart from being a B.Tech and an MBA holder, Mr. Khatri is a ‘Certified Lead Auditor’ by IRCA, UK, an RLA, RABSAQ of Australia, a Master Black Belt in Lean Six Sigma by AMT, USA, Six Sigma Black Belt, Morestream University and a member of ASQ. Mr. Khatri specifically focused on dispelling the myths prevalent in the minds of the students regarding the use of Green Belt Six Sigma certification to branches such as Marketing, Finance and HR. He presented cases of different organizations where the principles of Six Sigma proved to be beneficial in improving the overall processes and the functions of organization. 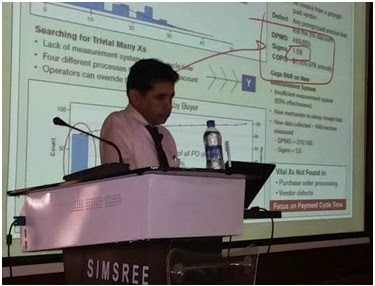 He presented the cases, where in, he showed how Six Sigma improved the market research process at a research consultancy, online payment systems at banks and resume shortlisting process at a HR consulting firm. He emphasized the need for this certification considering today’s businesses to be more complex with stricter deadlines. To back his own statements, he further went on to justify how simple hypothesis testing methods can lead to significant results by providing inputs for process improvement. He also touched the topics such as ‘DMAIC (Define, Measure, Analyze, Improve, Control)’ and ‘DMADV (Define, Measure, Analyze, Design, Verify)’ methods used to improve processes and develop new products respectively. With his crisp and exhaustive oratory, the entire batch was enthused about the efficacy of Six Sigma. His presentation was complimented well by the batch which offered him a plethora of questions to quench the inquisition generated by his words. By the end of the session, SIMSREE students seemed to be all the more geared up for SIX SIGMA. KnowledgeCert is a leading provider of Professional Courses Certification which provides Six Sigma Certification in USA a beneficial training and certification. This is an incredible post about Six Sigma Certification in USA Getting such a wide range of benefits is really amazing. Nice Post & a good info. Persuing it is very beneficial Lean Six Sigma Black Belt Certification Training in USA This also increases the market value. Six Sigma is a business management strategy that seeks to improve the quality of process outputs by identifying and removing the causes and defects . Definite, defined, measured, improved, analyzed and controlled manufacturing processes. Continuous efforts to achieve sustained and stable process results that are important for business success. Excellent!! You provided very useful information in this article. I have read many articles in various sites but this article is giving in depth explanation about Six Sigma Green Belt . Recently, I also took training on this “Lean Six Sigma Green Belt Online Training ” from Excelr.